Venture to the very source of southeast Asia along the Mekong River. From Vietnam to Cambodia, Laos to Thailand, life flows with these sparkling, rhythmic waters. On a Mekong river cruise, you will discover a way of life that has drifted unchanged for hundreds of years in this far-flung, exotic region. Along these serpentine riverbanks, mangrove forests teem with wildlife and local life passes by at a lulling pace. Floating water markets carry teetering piles of watermelons, luminous flowers and ginormous coconuts. Buffalo bathe in glittering rice paddies and rainbow-coloured temples peer across tree canopies. Visit old silk towns and explore the markets in old Hanoi. Marvel at the stunning ancient temples of Angkor Wat and the jungle ruins of Ta Prohm. Sample fresh coffee and cashew nuts in one of Laos’ many plantations, and devour your way through Thailand’s spiced cream pancakes. 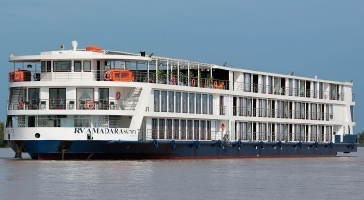 Give us a call today on 01903 694322 to book your Mekong River cruise. From the heights of the Himalayas to the southern coasts of the South China Sea, winding over 2,700 miles, the Mekong is much more than just irrigation for Indochinaeverywhere it flows, it fascinates men and shapes their lives. 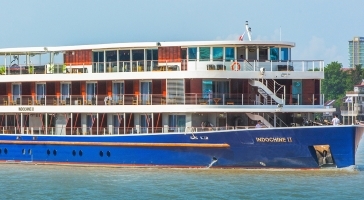 Come take an expedition on this grand and plentiful water snake, from the ruins of Angkor to Tonle Sap Lake following the footsteps of Henri Mouhot, to Phnom Penh and Ho Chi Minh City, still largely influenced by the French colonial days. 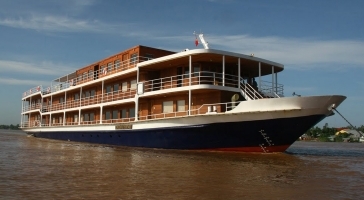 Our meditative trip takes you along the Mekong River on board a ship combining charm and colonial-style comfort. Cast off on a once-in-a-lifetime adventure on the legendary river that begins in the mountains of Tibet and meanders through no less than six countries. The Mekong traces the authentic, profound, and mesmerizing history of Vietnam and Cambodia along its riverbanks. Youll finish your extraordinary vacation in Indochina with a discovery of Hano, the Vietnamese capital, and on an unforgettable cruise on the legendary Halong Bay among the fantastically formed islands, crags, and cliffs. Youll begin your extraordinary vacation in Indochina with a discovery of Hano, the Vietnamese capital, and on an unforgettable cruise on the legendary Halong Bay among the fantastically formed islands, crags, and cliffs. Then, cast off on a once-in-a-lifetime adventure on the legendary river that begins in the mountains of Tibet and meanders through no less than six countries. The Mekong traces the authentic, profound, and mesmerizing history of Vietnam and Cambodia along its riverbanks. From the heights of the Himalayas to the southern coasts of the South China Sea, winding over 2,700 miles, the Mekong is much more than just irrigation for Indochinaeverywhere it flows, it fascinates men and shapes their lives. 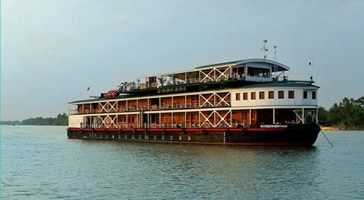 Come take an expedition on this grand and plentiful water snake, from Ho Chi Minh City, still largely influenced by the French colonial days, to Phnom Penh, Tonle Sap Lake and the ruins of Angkor, following the footsteps of Henri Mouhot. 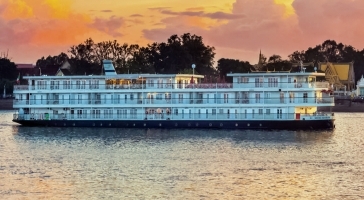 Our meditative trip takes you along the Mekong River on board a ship combining charm and colonial-style comfort.